Since Chapter 49 is conducting their charter doin's in the immediate future, I felt it was only fitting to write a report on its namesake---James Wilson Marshall. James Wilson Marshall was born in Lambertsville, New Jersey on October 8, 1810. At age 24, he started farming on the banks of the Missouri River. After a few years of battling maleria, James decided to head west for a healthier climate. He joined a wagon train on its way to the Oregon's Williamette Valley . In June 1844, He followed the Siskiyou Trail south into California, eventually reaching Sutter's Fort on July 1845. Being the "alcalde" (overseerer) of the Mexican area, John Sutter hired Marshall to work in the sawmill as well as other carpentry jobs around the fort. John helped finance James with land on the north side of Butte Creek, a tributary of the Sacramento River, and provided him with cattle. This began Marshall's second attempt at farming. Soon after, the Mexican-American War began in May 1846. James volunteered and served under Captain John C. Fremont's California battalion during the "Bear Flag Revolt." After the war he returned to his ranch in 1847, only to discover that his cattle had been run off or stolen. With his sole source of income gone, Marshall lost his land. Marshall soon entered into a partnership with John Sutter for the construction of a sawmill. James was to oversee the construction and operation of the mill, and in return he would receive a portion of the lumber. 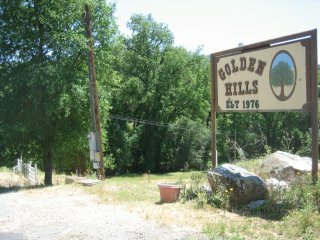 After scouting many areas, James decided upon Coloma, located about 40 miles upstream of Sutter's Fort on the American River. His crew consisted of local Native Americans and Army veterans. Construction continued into the beginning of January 1848, when he discovered that the ditch that drained water away from the waterwheel was too narrow and shallow for the volume of water needed to operate the the saw. Marshall decided to use the force of the river to excavate and enlarge the ditch. This was done at night so it did not disturb the sleeping daytime crew. On the morning of January 24, Marshall while examining the channel noticed some "shiny flecks" in the channel bed. He did not believe it at first, but after extensive testing he exclaimed "I Found It, I Found Gold!!!" Four days later he returned to Sutter's Fort and shared his booty with John Sutter. The gold was of the finest quality, at least 23 karats which equates to 96% pure gold. News of the discovery spread like wild fire. Everyone including his sawmill crew quit to search for gold. Unfortunately, the sawmill closed and Marshall left the area. In 1857, James returned to Coloma to start a vineyard. He successfully ran it for a few years. But in 1860, higher taxes and increased competition caused him to sell it. He decided to do some prospecting. He became a partner in a goldmine near Kelsey, California. But the mine yielded "nothing" and left Marshall practically bankrupt. The California State Legislature awarded him a 2 year pension in 1872 in "Recognition of his role in an important era in California History." It was renewed in 1874 and 1876 but lapsed in 1878. He eventually ended up in a small cabin "penniless." Marshall died in Kelsey on August 10, 1885. In 1886, the members of the "Native Sons of the Golden West-Placerville Parlor #9" felt that the "Discoverer of Gold" deserved a monument to mark his final resting place. In May 1890, 5 years after his death, this outfit convinced the State Legistlature to erect a monument for $9,000. Today a statue of James W. Marshall stands on top of the monument "pointing to the spot where he discovered gold" on January 24, 1848. This is the perfect date for James W Marshall, Chapter 49 to dedicate their Charter Doin's....(167 years later) I am going....are you?